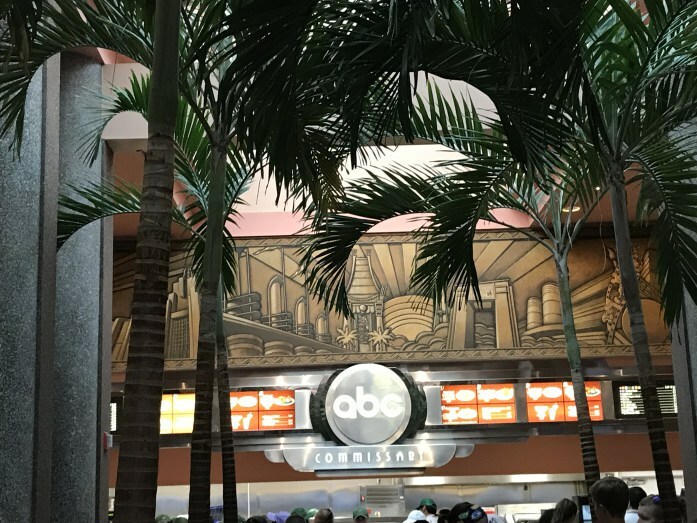 ABC Commissary, located at Disney’s Hollywood Studios, is a quick service restaurant that offers sandwiches, burgers, and salads. We recently stopped by the restaurant for dinner, where the menu changes to offer a more fast-casual meal that includes steak with chimichurri sauce and salmon. It’s been a while since we’ve dined at ABC Commissary, so it was a nice change of pace from the Backlot Express, which is our other default quick service option when we visit Hollywood Studios. ABC Commissary is set to resemble a working cafeteria to the stars. Basically, imagine if you were working on a TV show or movie, this is where you might go to grab a lunch or dinner. The interior is pretty basic with simple tables, chairs, and booths, with some TV memorabilia thrown in here and there. Overall, it is pretty sparse. However, one touch that is unique and quite charming is that there are real live trees in the restaurant.